For almost 50 years, George Takei has been a pioneering voice in culture, co-starring in the original “Star Trek” television series and becoming known to a new generation of fans as an online social commentator and humorist. But Takei took on a more serious and somber tone this week, revisiting the city of Hiroshima to commemorate the 69th anniversary of the devastating atomic bomb attack that killed more than 100,000 people. Takei was in Hiroshima to tape a new episode of his ongoing web series “Takei’s Take” on AARP's YouTube Channel. But he also used the experience to open up about his firsthand experience of living in a Japanese American internment camp in 1942. Takei was just 5 years old when along with his younger brother, sister and their parents, was placed inside an internment camp in Rohwer, Arkansas. Later, they were moved to a second camp in Tule Lake, California. Although he and the other prisoners were largely cut off from the outside world, word began to spread through the camp shortly after the atomic bombs had landed in Japan. One of those attacks led to the death of Takei’s aunt and his 5-year-old cousin. Takei said he hopes keeping the memory of Hiroshima alive will encourage people to pressure world leaders to disarm nuclear weapon stockpiles and to rethink warfare itself. “We try to humanize the issue rather than talking intellectually about it,” he said. “I hope it intrigues people to go visit Hiroshima. I come here and can’t help but get a larger understanding of conflict. They called it "The Good War." But now, these countries who we were fighting — Japan, Germany and Italy — they are our allies. We’ve got to find a more intelligent way to resolve our conflicts. In recent years, the actor and author greatly expanded his following by becoming a genuine Internet phenomenon, focusing on issues like marriage equality. Much like fellow "Star Trek" actor Patrick Stewart, Takei has developed a huge online following, generating more than 7 million fans on Facebook alone. He’s even one of Amazon’s top 1,000 reviewers, with his ironic faux reviews of oddball products. 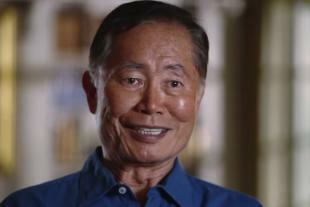 And since so much of his newfound fame is Internet-based, Takei says promoting more serious issues like nuclear arms through commentaries like the one on Hiroshima makes sense because it provides access and context for people from younger generations who no longer have living relatives with a direct connection to World War II. Near the end of our interview, Takei said that discussing so many weighty issues was making him feel "philosophical.” So I decided to shift the discussion to what I thought might be a lighter topic: his ability to stay out front of popular culture for decades. At the beginning of our call, Takei mentioned how he had just finished an unusually vigorous workout at the gym. Much like his former co-star William Shatner, Takei has maintained a steady exercise routine.